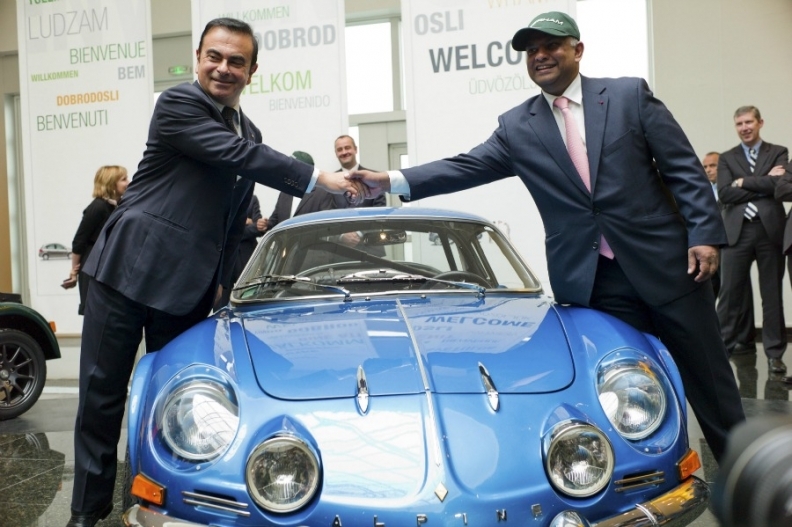 Renault CEO Carlos Ghosn, left, and Caterham Chairman Tony Fernandes shake hands over an Alpine sports car in Paris last month after agreeing to revive the Alpine brand. PARIS (Bloomberg) -- Renault, which is losing sales faster than any other major European carmaker, is pinning a turnaround in part on the revival of a sports car brand that's been dormant for almost two decades. The plan relies on a partnership with Caterham Group, a British manufacturer of offbeat track cars that typically have exposed front wheels and rollbars rather than roofs. For enthusiasts of Renault's mothballed Alpine marque, the key factor is just getting the brand back on the road. "Alpine fans have been waiting for this for 20 years," said Gerard Bailly, 60, a brasserie owner in Dole, eastern France, who has two Alpine cars and runs a club for the brand. "Of the 35 people in my club, at least half will buy it." Renault, which also makes budget Dacia vehicles, is shifting upmarket, mimicking the strategy of Volkswagen Group. VW Group relies on Audi for 48 percent of operating profit, even though the upscale brand accounts for just 14 percent of deliveries. Renault's goal is to carve out a niche in the luxury-car market, which could in turn give its mass-market models an edge. "It's a good idea to introduce Alpine as there will be a halo effect" for Renault's other models, said Neil King, an automotive analyst at research company Euromonitor International. The move follows similar steps by PSA/Peugeot-Citroen and Fiat to attract wealthy buyers. With auto demand in Europe contracting for the fifth straight year, mass-market carmakers are looking for ways to boost revenue as the effects of the debt crisis weigh on demand. Renault halted Alpine production in 1995 after four decades because of poor profitability. Sales peaked at about 2,000 cars a year in the 1980s. The cooperation with Caterham, Renault's Formula One racing partner, is aimed at spreading costs that could approach 1 billion euros ($1.3 billion), according to an estimate from Bankhaus Metzler. "Alpine and everything that goes with it has high emotional and business value," said Bernard Ollivier, CEO of Renault Alpine. While production ended years ago, "generations of people have seen this car," said Ollivier, who vows that the revived brand will be profitable. "They represent live embers. You just need to blow on them to make them burn again." Renault and Caterham will each own 50 percent of the Alpine venture, according to an agreement signed last month. Both companies will introduce their own versions within three to four years. Alpine vehicles are set to cost slightly more than the Renault Espace minivan, the carmaker's most expensive car at 35,700 euros. That price range would put Alpine in competition with the Toyota GT86, BMW Z4 and Audi TT. "Renault's new Alpine may end up looking like the poor man's Porsche Boxster," said Philippe Houchois, a London-based analyst with UBS. "There's some room for that." For now, any sales boost would be welcome. Renault's European deliveries plunged 18 percent through October, outpacing the industrywide 6.9 percent slump as the market heads for its worst drop in 19 years. The company has suffered more than most as it seeks to hold incentives in check to protect profit. PSA, France's largest carmaker and the second-largest in Europe, was prompted to seek 7 billion euros in government loan guarantees for its banking arm as sales tumble and cash reserves dwindle. Renault is already indirectly active in the luxury-car market through its alliance partner Nissan, which owns the Infiniti brand. Renault also shares technology with Mercedes-Benz parent Daimler as part of a partnership. Still, establishing an upscale brand can take decades. Audi's rise to become the world's second-largest luxury brand began in the 1980s when Volkswagen Chairman Ferdinand Piech was in charge and spearheaded Audi's technology push. In addition to reviving Alpine, Renault is considering turning its Initiale Paris insignia, which is used for high-end special editions, into full-fledged luxury brand. The push for wealthy drivers faces growing competition from other mass-market European carmakers. PSA is expanding its upscale Citroen DS line, and Fiat is bolstering Alfa Romeo with nine models, including the 4C sports car. Alpine vehicles will be produced at Renault's factory in Dieppe on the French Normandy coast, the historical home of the brand. The plant, which currently assembles racing vehicles and other limited-run models, employed 322 people at end of June. The new brand faces volatile demand. The entry-level sports-car market is driven chiefly by new models and can swing wildly depending on the confidence of its customers, which are more sensitive to the economy than buyers of Ferraris and Lamborghinis. Sales in the segment last year totaled 46,900 vehicles, 71 percent below the 2006 peak. Demand is forecast to bounce back and average 115,000 vehicles through 2016, buoyed by cars including the revamped Porsche Boxster and Cayman, both of which were unveiled this year, according to IHS Automotive. To make Alpine a viable player in a market that appeals to driving aficionados rather mere car buyers, Renault will have to be careful to keep the brand authentic. "They should keep the Renault logo off and only leave the Alpine one," said brand-enthusiast Bailly. "When Fiat bought Ferrari, they never put their Fiat logo on Ferrari cars."